The new X3 xDrive28d will offer BMW's 2.0-liter TwinPower turbodiesel four-cylinder engine rated at 180 horsepower and 280 pound-feet of torque, mated to an eight-speed automatic transmission. 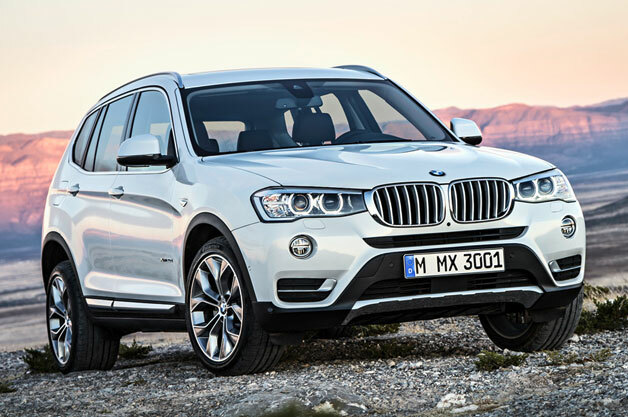 BMW says the X3 clean diesel will accelerate from zero to 60 mph in just under 8 seconds. A newly offered rear-wheel-drive X3 sDrive28i is powered by the 2.0-liter TwinPower turbo gasoline engine, with output measuring 240 hp and 260 lb-ft to torque. BMW says the rear-drive-gasoline package will sprint from zero to 60 mph in 6.2 seconds. The gas-powered 2.0-liter X3 is also available with all-wheel drive. The third engine option is the 3.0-liter inline-6 in the X3 xDrive35i. It's good for 300 hp and maximum torque of 300 lb-ft. The entry-level rear-wheel-drive BMW X3 sDrive28i starts at $39,325, while the all-wheel-drive X3 xDrive28i is priced at $40,725. The diesel-powered X3 xDrive28d starts at $42,825 and the top-of-the-line X3 xDrive35i carries a $45,825 sticker price. All prices include BMW's $925 shipping fee. Car shoppers will be able to distinguish the 2015 X3 from the previous model by new front and rear bumpers and exterior mirrors with newly integrated turn signal indicators. New twin circular headlights with a full-LED option flank a revised kidney-shaped grille. New exterior colors are available, as well as four new upholstery colors and four new trim options to differentiate the X3's cabin. The revised climate control system features a high-gloss black panel display, and new cupholders are nestled in the X3's center console beneath a sliding cover. Additional cabin tech features include a standard 6.5-inch iDrive display and iDrive Controller with touchpad functionality and a Harman Kardon stereo system, along with a host of safety features. The new X3 offers Parking Assistant, a full color head-up display, a lane departure warning system, frontal collision warning, pedestrian warning and a collision mitigation system. Assisting the X3's inherent utility is BMW's Smart Opener, which allows drivers to open or close the tailgate automatically with a short movement of the foot below the rear bumper. A storage package including a reversible floor section, folding box and cargo nets allows for safe storage in the BMW's cargo area, and the 40/20/40 split-folding rear seat offers maximum flexibility.